DR Exclusive Video: HK416C (also written HK 416C) “Ultra Compact Assault Rifle” SBR/PDW (Short Barreled Rifle/Personal Defense Weapon) Fired on Full-Auto at NDIA Infantry Small Arms Systems Symposium 2011 Range Day Shoot! | DefenseReview.com (DR): An online tactical technology and military defense technology magazine with particular focus on the latest and greatest tactical firearms news (tactical gun news), tactical gear news and tactical shooting news. DR Exclusive Video: HK416C (also written HK 416C) “Ultra Compact Assault Rifle” SBR/PDW (Short Barreled Rifle/Personal Defense Weapon) Fired on Full-Auto at NDIA Infantry Small Arms Systems Symposium 2011 Range Day Shoot! All photos contained in this article were shot by DefenseReview.com (DR), and are copyrighted. DefenseReview.com owns the copyright on these materials. The photos were shot with a Canon PowerShot S90 10-megapixel digital camera (still camera with video capability). All video clips contained in this article belong to DefenseReview.com (DR), and were shot as a courtesy by writer/photographer Nick Leghorn from TheTruthAboutGuns.com (TTAG), using a Panasonic Lumix DMC-G2 12.1 MP Live MOS Interchangeable Lens Camera with Panasonic 45-200mm f/4.0-5.6 Lumix G Vario MEGA OIS Zoom Micro or Olympus 50mm f/2.0 Macro ED Zuiko Digital lens. May 27, 2011 Last updated on 6/03/11. While we're on the subject of 5.56mm NATO PDWs/SBRs (Personal Defense Weapons/Short-Barreled Rifles), we should perhaps mention that DefenseReview (DR) also had the opportunity to run a few rounds through the new HK416C (also written HK 416C) select-fire 5.56x45mm NATO (5.56mm NATO)/.223 Rem. compact assault SBR/PDW at the Camp Atterbury Joint Maneuver Training Center (CAJMTC) firing range at during the 2011 International Infantry & Joint Services Small Arms Systems Symposium, Exhibition & Firing Demonstration Range Day shoot on May 26, 2011. The Heckler & Koch (HK) staff at the range gave us a short magazine with a fairly limited number of rounds, so the firing sequence is very short. However, we at least wanted to show our readers the weapon being fired. DR has a good number of still photos that we plan to publish in a subsequent article and/or add to this article, so stay tuned. It goes without saying that DefenseReview would have at least liked to have fired several full 30-round magazines through the weapon (HK416C). However, HK is notoriously frugal with the ammo they supply to each shooter at this type of range event. Having said (or, in this case, written) that, the HK416C is a cool little gun, albeit a bit larger and heavier than the FN SCAR PDW 5.56mm. Like the FN SCAR PDW, the HK416C doesn't allow for an optimum cheek weld. The HK416C does away with the traditional AR buffer (AR-15 buffer), instead utilizing a bolt carrier with a hollowed-out rear section. The HK416 Compact's cyclic rate of fire (ROF) is slower than the standard HK416 with standard AR buffer system. Defense Review enjoyed firing the HK 416C in the limited capacity we were allowed. If the HK416C proves reliable, accurate, and durable under adverse combat conditions and high round count, it should prove to be an effective weapon for executive protection/PSD Security Operations, vehicle ops, Direct Action (DA) missions, and general CQB (Close Quarters Battle) applications. Editor's Note: The video clip below was shot for us as a courtesy by The Truth About Guns (TTAG) (TheTruthAboutGuns.com) staff writer and photographer Nick Leghorn. Nick's a nice guy and a great videographer, and we appreciate his assistance with the video. Thanks, Nick! 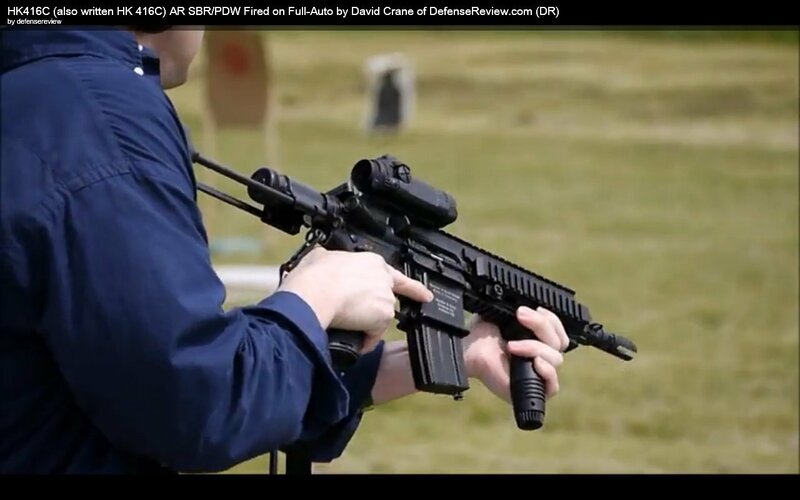 DefenseReview will be uploading an additional video of DR owner/editor-in-chief David Crane firing the HK416C on full-auto (also shot from the right side with our own camera, just from further back and not utilizing any zoom), soon. Defense Review would also like to thank the Heckler & Koch USA (HK USA) at the range day shoot for allowing us to fire the weapon. It should be noted that DR also shot photographs of the HK416C at both the 2011 Special operations Forces Industry Conference (SOFIC 2011) and NDIA Infantry Small Arms Systems Symposium 2011, which we plan to publish soon. 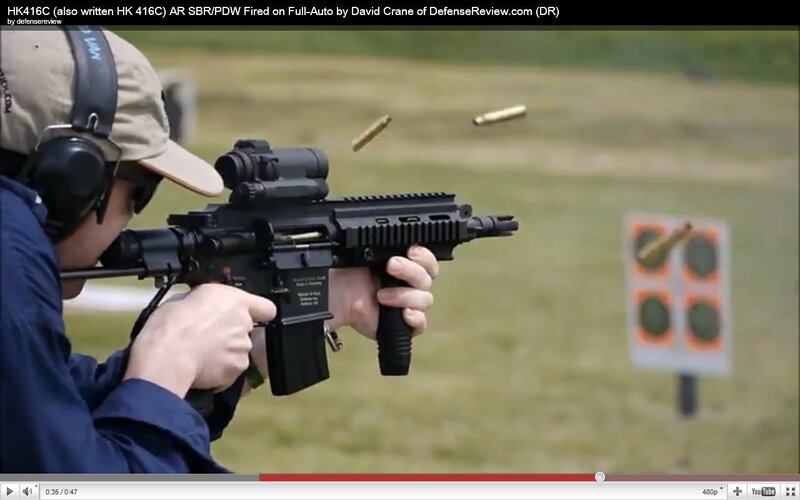 In the meantime, we'd ask that you take a quick look at the video clip below, which features DefenseReview.com owner/editor-in-chief David Crane test-firing the HK416C assault SBR at the range. © Copyright 2011 DefenseReview.com (DR). All rights reserved. This content/material (including any/all video clips) may not be republished, broadcast, rewritten or redistributed without first receiving permission and providing proper credit and appropriate links. DR Exclusive Video: FN SCAR PDW (Personal Defense Weapon) Prototype 5.56mm NATO Assault SBR Fired on Full-Auto at NDIA Infantry Small Arms Systems Symposium 2011 Range Day Shoot! Previous: DR Exclusive Video: FN SCAR PDW (Personal Defense Weapon) Prototype 5.56mm NATO Assault SBR Fired on Full-Auto at NDIA Infantry Small Arms Systems Symposium 2011 Range Day Shoot!